International team captain Ernie Els will have been pleased with the form of several contenders for a place in the Presidents Cup to hosts Team USA in Melbourne later this year. Four Presidents Cup hopefuls won their respective groups and advanced to the round of 16 at the WGC-Dell Tech Match Play. Australia’s Marc Leishman remains at the top of the standings after delivering a flawless 3-0-0 record in group play, including a 5&4 win over likely opponent Bryson DeChambeau. 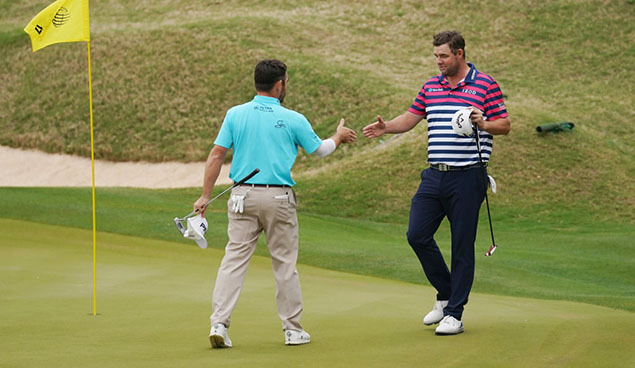 Leishman was defeated by three-time Presidents Cup participant Louis Oosthuizen in the round of 16. The South African No 1, who advanced out of his group for the fourth time in five years, fell to eventual winner Kevin Kisner in the quarter-finals 2&1, and remains No 2 in the International Team standings after finishing runner-up at the Valspar Championship two weeks ago. Not yet in the automatic qualifying spot, Branden Grace’s form in Texas has also improved. He jumped to No 12 in the standings after a 3-0-0 performance of his own in group play, which included a 1-up victory over Dustin Johnson. Grace’s run was halted by Sergio Garcia in the round of 16. The quest to become the first player from China to compete in the Presidents Cup continued in the right direction for Haotong Li, who defeated 2018 PGA TOUR Player of the Year Brooks Koepka on the way to advancing out of group play. Li’s week ended in the round of 16 with a loss to Kisner, but the 23-year-old remains among the top 8 automatic qualifiers at No 5 in the International Team standings. The Presidents Cup will return to The Royal Melbourne Golf Club for the third time from 9-15 December, when the International Team, led by Captain Ernie Els, will take on the US, led by Captain Tiger Woods.